...is really not a baby anymore. It's bittersweet. It's so nice to not be changing diapers or waking up at night (usually, anyway). She can buckle herself into her car seat and take a shower now. She is a chatterbox and constantly entertains us. Right now she's really into putting on "performances" for us—she'll inform us that the curtain is "going up" and then starts her ballet, interspersed with a few no-quite-complete cartwheels. It's easy to see why the three year-olds are called the Sunbeams in primary—she literally shines and brings light. It's hard to come up with anything I haven't liked about her at age three. So as she turns four, I guess the bitter part is just knowing that it's all going by too fast. 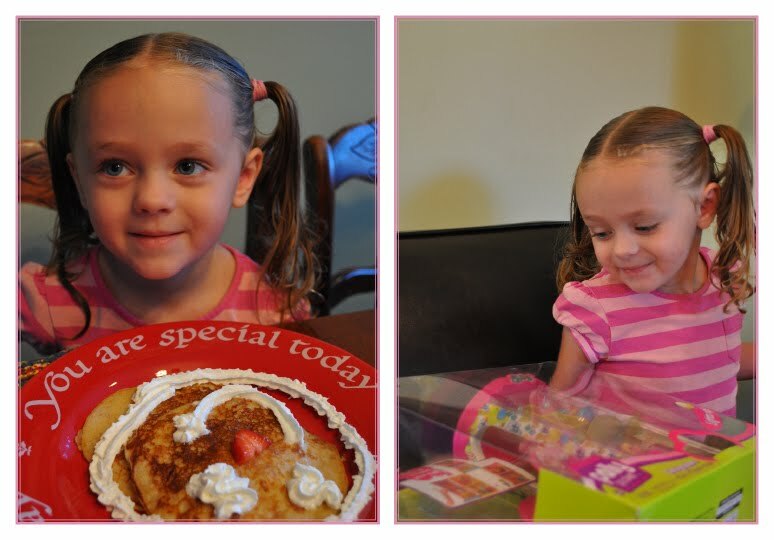 Since her birthday was on Saturday, we had a breakfast celebration, with the best pancakes I've ever tasted (thank you Martha Stewart! ), followed by gifts, and after that no other celebrating was necessary—she and Ellie played with her new toys all day long. Actually, we did celebrate a little more, on Sunday, when I made her cake. 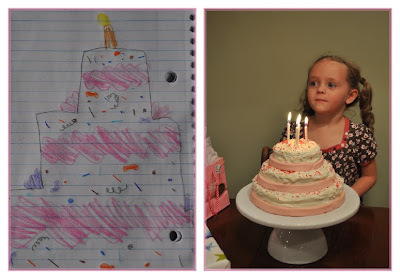 Ellie had drawn a picture of a birthday cake, and Ainsley wanted that cake. I did my best, and I must say, my cake tasted better. I used the Brownie Cake recipe, cream cheese frosting, marshmallow fondant, and of course, sprinkles. Here's hoping that year four is even better than year three. We love you so much Ains!